South Woodham Ferrers is a town in Essex with a population of around 17,000 people. The name is likely to have come, in part, from the Norman Knight De Ferrers who was granted the land in this part of Essex as recognition of his role in the Norman Conquest. It was named South Woodham Ferrers to distinguish itself from the village, Woodham Ferrers, which lies a mile to the north. It was the arrival of the railway in 1889 that triggered the first phase of growth in the town, which until then had been farmland. Soon after this, much of the unproductive farmland was divided into plots and offered for sale which people bought and many self-built buildings soon appeared. The town really took shape from the 1960s when the larger housing developments began to be established. This accelerated in the 1970s when Essex County Council used compulsory purchase orders to re-develop the old farmland plots into modern housing, a main town centre shopping area, new schools and areas for employment. I have visited South Woodham Ferrers once before (incidentally, on the way home from Burnham-on-Crouch parkrun), and this was to have a look at a special set of residential streets in the south-west corner of the town which take their names from the works of J.R.Tolkien. Gandalf's Ride, Hobbiton Hill, Thorin's Gate, and Gimli Watch are just a few of the roads you'll find here. To the south of the town you will find Marsh Farm Animal Adventure Park and Marsh Farm Country Park. The two are adjacent but operate as separate entities. The majority of the original Marsh Farm was part of the land that was purchased by the council in the 1970s, the remainder of the farm is now open to the public. The country park is nestled between three waterways - The River Crouch, Clementsgreen Creek, and Fenn Creek. It is a Site of Special Scientific Interest (SSSI) which covers 300 acres of grazing marshland that provides home to an abundance of wildlife including water voles and many species of wading birds. The park became home to South Woodham Ferrers parkrun on 10 March 2018. 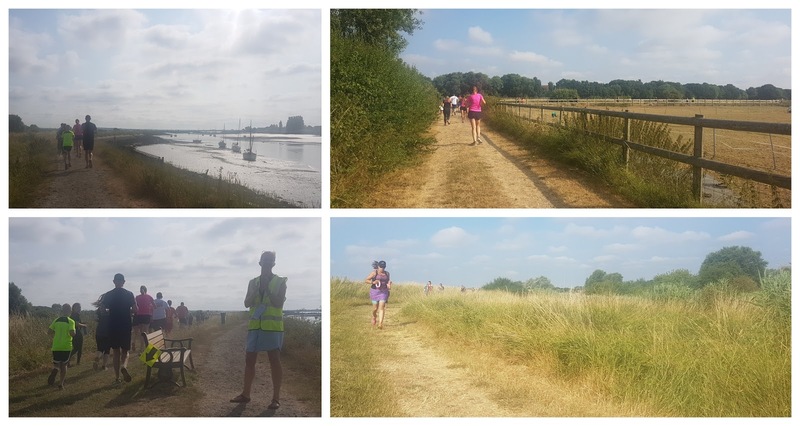 On 14 July 2018 we drove over to the country park to take part in event 18 of the parkrun. We parked in the free car park at the animal adventure park as advised on the official course page. The adventure park houses the toilets and the post-run café, so I popped in to use the facilities before heading off to find the start area. Travel by train is possible via South Woodham Ferrers Station, which is 2km away in the centre of the town. The run itself starts in the country park car park adjacent to the River Crouch (not the one you are advised to park in) and takes place over a flat, 1 lap clockwise course which is has elements of an out-and-back. Underfoot you will find a mixture of concrete, grass and dirt paths which are likely to be dry and dusty in summer but potentially wet and splashy in place during the winter. Road shoes were fine when I attended but trail might come in handy in the winter. The event currently attracts around 100 participants each week. So, from the car park the route heads eastwards with the river to the right as it passes the South Woodham Ferrers Yacht Club, with the participants taking the grassy path when directed to by the marshal and arrow. After 700 metres the route leaves the riverside and heads inland towards the rear of the animal adventure park. The adjacent fields are all used as farmland so if you're lucky you should spot sheep and horses around here. The path soon turns to concrete and the participants follow it as it passes the grazing fields. At the most northern point of the course, underfoot changes back to stones/dirt/grass and the path shoots up a short, sharp incline and bears to the right where it meets Clementsgreen Creek for an out-and-back section. Travelling along the upper path, the course winds its way along the edge of the creek all the way round to the end of the path where a marshal is on hand to direct participants down a short, sharp decline and everyone then heads back along the lower path. The country park is beautiful and peaceful, and I even spotted a few swans hanging out in one of the ponds. Once the out-and-back section is complete, the participants are directed to the south along a grass path that leads all the way down to the river where again the path heads up a short, sharp incline up onto the sea wall. The final stretch takes place along the gravelly riverside path and this leads all the way back past the yacht club and into the car park where the finish line can be found. Barcode scanning takes place adjacent to the finish line and when all the participants have returned, the team head over to the post-run cafe 'Tillie's' at the animal adventure park. We also went to the cafe, but when we arrived at 10.30am it was open but unstaffed. Even when someone came along to serve us, there weren't any breakfast options available. We had a tea each and I grabbed some crisps from the counter. Despite its setting in a lovely, old, 19th century timber framed barn, it was pretty a disappointing experience, and sadly there were only two other people from parkrun there. So we finished up and went to have another browse around the Tolkien-themed streets in the town. The parkrun however had been fantastic - for a change, my daughter and wife (with 12 week old baby) also took part marking our son's first time going round a parkrun course. The country park is scenic, the river looked amazing and the volunteers were all fabulous. As always I had recorded the run on my Garmin and you can see the course profile etc on my Strava page. There's also a course fly-by video which I created with the Relive app on my phone which can be found on youtube.